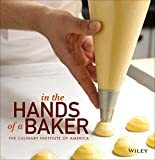 In the Hands of a Baker from The Culinary Institute of America helps bakers and pastry chefs identify, understand, and utilize the tools and equipment needed for successful professional baking. This indispensable book provides in-depth information on how to choose the best equipment for any baking job—from scaling and measuring tools to cutting and confectionery tools, and from small appliances to bakeware and beyond—along with proper techniques for handling and maintaining that equipment. The text also covers basic and specialized tools for every area of expertise in the craft, including baking bread, making chocolates and candies, and creating cakes and pastries. Chapters range from organizing a station to understanding the differences between home and professional equipment. This valuable resource also features step-by-step instructions with supporting photography and illustrations throughout—all in one affordable package. Founded in 1946, The Culinary Institute of America is anindependent, not-for-profit college offering bachelor's andassociate degrees in culinary arts and baking and pastry arts, aswell as certificate programs in culinary arts and wine and beveragestudies. A network of more than 45,000 alumni has helped the CIAearn its reputation as the world's premier culinary college.The CIA, which also offers courses for professionals and foodenthusiasts, as well as consulting services for the foodservice andhospitality industry, has campuses in Hyde Park, New York; St. Helena, California; San Antonio, Texas; and Singapore.